As I come closer to the end of the Pentateuch in my chronological Bible reading for 2013(I'll be done with Deuteronomy in about two weeks), some of my favorite characters are beginning to disappear off the pages. One of them (who, in my Bible reading anyway, died earlier this week) is a very real person to me. She had her highlights and her lowlights. Very human. And aren't those the characters we can relate to best? Miriam, older sister of Moses and Aaron, first appears in God's Word (unnamed at this point) in the second chapter of Exodus, and appears throughout the action of the Pentateuch until her death in Numbers 20:1, just before the Israelites entered the Promised Land (and only a handful of verses before her brother Aaron - Numbers 20:28). Miriam is likely most well-known for her role in her brother Moses's "adoption" by an Egyptian princess and his return to their mother Jochebed (see my Bible character biography of Jochebed for more thoughts on that), at least for a time. It was Miriam who stood watch over her brother's papyrus basket. 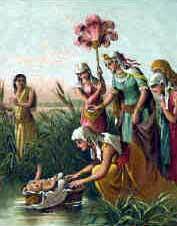 It was she who approached the Egyptian princess and offered to get a wet nurse for her brother. It was Miriam who reunited her mother with Moses and allowed her to nurse and raise him despite the pharaoh's edict. But that isn't her only appearance in the narrative. Miriam also led the Israelite women in a song of deliverance after the Red Sea crossing (Exodus 15:20-21). She was the first named prophetess in the Bible (also in those same verses). But she was not perfect - just like you and me. In Numbers 12, she and Aaron began to speak against Moses. Apparently, they complained about his Cushite wife and felt a bit jealous for all the attention and recognition their younger brother was getting. And the Lord heard them (Numbers 12:2) and disciplined them for it. God chastised them for speaking against His friend Moses (Numbers 12:6-9), and once He left, Miriam had been given leprosy. It was only through Aaron and Moses's pleas that she was healed. Some characters in the Bible seem larger than life - almost too perfect. I can't always relate to those characters. Miriam is NOT one of them. She had her good days and her bad. She saved her brother, celebrated with her people, and gave in to good old-fashioned sibling rivalry. Do you feel like you need to be perfect? How can Miriam help you remember it's okay to make mistakes? You're very welcome. Thanks for reading, and posting! Thanks for stopping by, Barry - will have to check your post out. Have a blessed day!